West Bands earn 15% of all sales for the day. Full Marching Band rehearsal. Eat a good breakfast and arrive by 11:15am with some sections arriving earlier (but not before 10am). Do not bring food or uniforms to rehearsal. At 3:30pm, go home eat lunch and change into uniforms. 5:30pm: Arrive in full uniform at Beautiful Savior Lutheran Church Parking lot. Stop by between 4 – 8 pm and show this flyer when ordering. 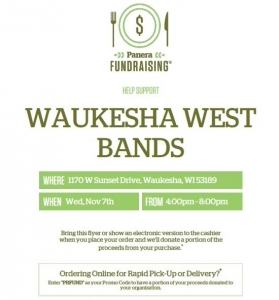 20% of your purchase will be donated to Waukesha West Bands.